"All of the python work at Big Cypress is focused on controlling this invasive species, which poses significant threats to native wildlife," the park said. A group of researchers removed a record-breaking 17-foot python from a south Florida national park. The enormous female snake, which weighed 140 pounds and was carrying 73 developing eggs, was captured at Big Cypress National Preserve in Ochopee. A photo posted Friday to the park's Facebook page shows four people holding the large reptile. 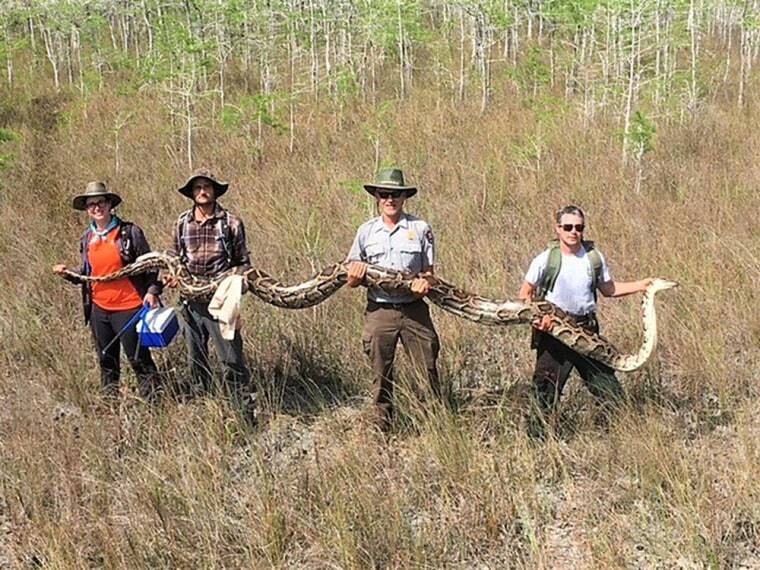 Big Cypress said the snake was the largest python ever removed from its park. Researchers were able to find the massive reptile by tracking male snakes with radio transmitters. "The team not only removes the invasive snakes, but collects data for research, develop new removal tools, and learn how pythons are using the Preserve," the park wrote on Facebook. "All of the python work at Big Cypress is focused on controlling this invasive species, which poses significant threats to native wildlife." According to the National Parks Traveler, an independent media organization, scientists have said that small mammals such as raccoons, bobcats and opossums are being wiped out in some South Florida parks because of pythons.